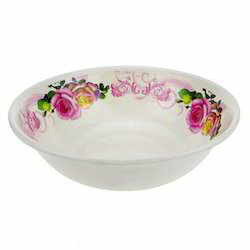 We are backed by immense industry experience of supplying and trading huge array of Serving Bowls including Dinner Bowl. It is available in different sizes and shapes to match requirements of our clients. The 4 Pcs. Insulated Modern Hot Pot Set supplied by us is known for its contemporary style and durability. We use stainless steel for making the inside bowl of these pot. This helps keeping the food warm for longer period. Some of the salient features of this range are long-lasting sheen, perfect finishing and cost-effectiveness. Offering a wide range of Natural Dinner Bowl are made from naturally fallen leaves of Palm Tree (Areca) Earth Friendly / Renewable / Sustainable / 100% Natural. We are one of the well renowned manufacturers and suppliers of Areca Bowls. Our product range is available in various eye catching designs, sizes and shapes. Offered products are highly appreciated for their salient features like attractive design, fine cuts, long lasting polish, durable, leak proof & eco-friendliness. Aesthetically designed and competitively priced, we provide a wide range of Wip Bowls. We are well-known firm of Acrylic Ripple Designs Bowl Sets. In addition, quality experts also check the quality of this product on varied industry standards. Besides, we offer this product at nominal costs. This is a Microvable Bowl (Set of SIX piece) which is Food Grade and unbreakable.